The Bank of Tanzania (BOT) has revoked the banking license of Covenant Bank, Efatha Bank, Njombe Community Bank, Kagera Farmers’ Cooperative Bank, and Meru Community Bank, on the basis of their undercapitalization. “Continuation of their operations in their current capital position is detrimental to the interest of the depositors and poses a risk to the stability of the financial system,” BOT adds. Pursuant the Act, the Central Bank has taken possession of the banks and placed them under compulsory liquidation via the Deposit Insurance Board (DIB). Every bank and non-bank financial institution which is licensed to carry on banking business in Tanzania must be a contributor of premium to the Deposit Insurance Fund. In a news conference that took place in Dar es Salaam, BOT’s Governor Prof. Benno Ndulu said that the Central Bank will start issuing compensation to depositors within a month. 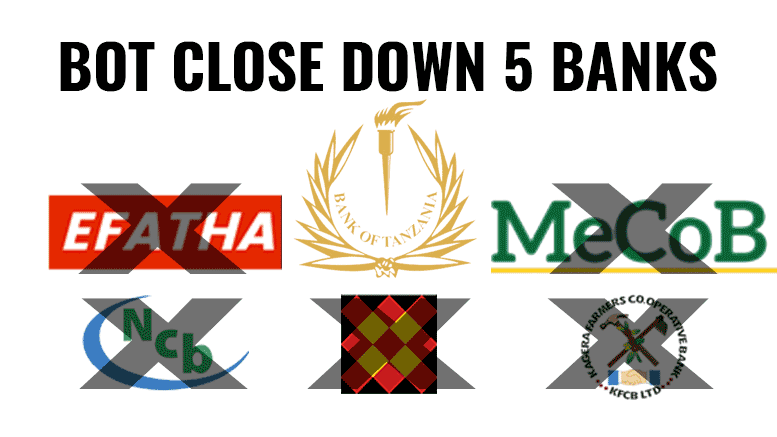 The closure of these banks follows a recent directive by President John Magufuli to close all non-performing banks. In May 2017 BOT revoked the banking license of Mbinga Community Bank for being critically undercapitalized.